Tarangire National Park is the sixth largest in Tanzania and covers some 2,850 square kilometers of the Manyara Region. While smaller in size than Serengeti or Ngorongoro, Tarangire is still known for its impressive population of elephants and lions. Travelers to this protected area will certainly see zebra, wildebeest, giraffe and baboons, as well as some of the 550 species of indigenous birds that call Tarangire home. Because the park has only one major water source—the Tarangire River—it’s the perfect place for spotting all of Tanzania’s wildlife, particularly during dry season. Between June and October, animals from across the park flock to the river—a scene that makes for spectacular photo ops. Tarangire National Park is four hours south of Arusha and accessible via a tarred road. It is about 43 kilometers from Lake Manyara National Park. Heavy rains between March and April can make spotting wildlife a challenge, so travelers looking for a safari experience should avoid the park during these two months. This tour will take you through the following national parks: Lake Manyara, Serengeti, Ngorongoro crater, Tarangire and Arusha National park. Enjoy en-route animal viewing as your professional tour guide describes and explains in detail the different species of animals. Explore some of Tanzania's most renowned national parks on a 3-day safari journey. Depart from Asusha on a multi-day tour that includes numerous game drives and visits to Tarangire National Park, Ngorongoro Crater and Lake Manyara, known for its impressive display of migrating pink flamingos and tree-climbing lions that frequent its inland acacia woodlands. Bed down in large, two-person tents along the way and rest easy for a few days of early starts, making the most of your wildlife sightings in the company of experience and knowledgable guides. If you only have one day to visit Tarangire National Park from Arusha, going with a guided tour is a great option for making the most of every minute. 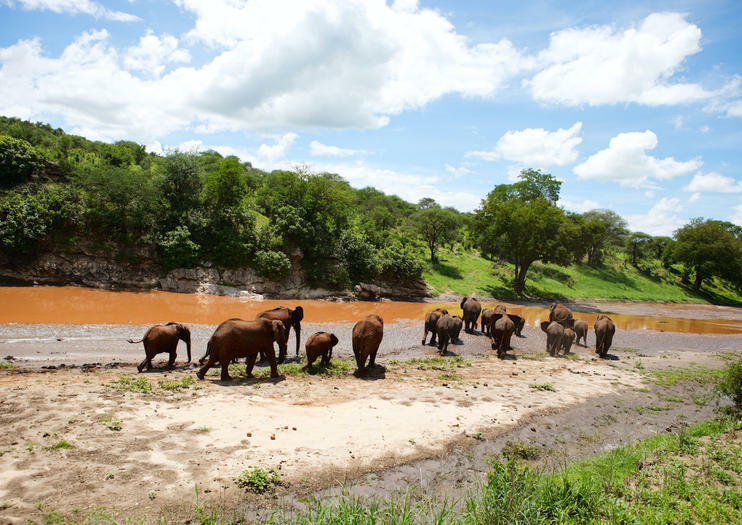 Your guide brings you from the city to wildlife viewing areas in the park for your best chance at seeing elephants, giraffes, lions and more in their natural habitat. A picnic lunch is also included as a midday pick-me-up. No need to choose between wildlife safaris and lounging seaside. With this 14-day 'Bush to Beach' holiday from Arusha you'll get the best of both worlds. Embark on multiple game drives in some of Tanzania's most renowned national parks, including Tarangire, Ngorongoro Crater, Lake Manyara and the fabled Serengeti. On day 9 board a flight to the storied archipelago of Zanzibar to relax along stunning white sand beaches and beside swaying palm trees. Cool off in the surrounding waters or simply spend your remaining afternoons lazing in the sun. Trek through three of Tanzania’s national parks on this five-day safari. See an amazing array of animals and archelogical wonders at each of the stops on this tour: the national parks at Tarangire, Lake Manyara, and Serengeti; Ngorongoro crater; and Olduvai Gorge. You’ll stay in game lodges and tented camp accommodations and travel by 4x4 vehicle on this adventure many have only dreamed about. Experience Tanzania's most iconic national parks on a 5-day budget camping safari from Arusha. Traverse African bush and tall grasslands in search of the 'Big Five,' as well as a multitude of other exotic wildlife like hyena, wildebeest, crocodile, giraffe and zebra. Cross the fabled Serengeti and marvel at Lake Manyara's pink flamingo sea. Gaze into the breathtaking expanse of the Ngorongoro Crater, bask in the remoteness of Tarangire National Park—known for its vast elephant migration—and even engage with Maasai villagers along the way.